These three modules were sponsored by the Great Lakes Sea Grant Network and the NOAA Great Lakes Regional Collaboration Team. Each module consists of a presentation (available in PowerPoint format) and supplemental materials, including worksheets, handouts, and evaluation forms. Presenters may wish to use the evaluations at the end of a presentation or training workshop. All of the supplemental materials are available here. Module 1: What Am I Adapting To? 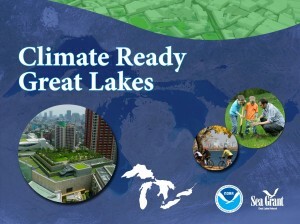 Module 1 presents an overview of predicted climate change impacts in the Great Lakes region, including predicted changes in temperature, storm events, Great Lakes water levels, and lake ice cover, and other factors. This module was designed to inform decisionmakers of the potential range of variability in climate change predictions for the Great Lakes region, and how these changes are likely to impact their community. Module 2: What is an Adaptation Plan? Module two presents a planning process to help communities conceptualize the effects of regional climate change predictions for their local areas so they can assess their vulnerabilities. This determines the impacts for which they will need to develop an adaptation plan. The module additionally describes strategies for adaptation in relation to stormwater management, drought, infrastructure, ecosystems, and urban heat. Module 3: What Tools are Available to Help Me? Module 3 highlights tools that have been developed by NOAA, Sea Grant, and other federal agencies to assist local communities with assessing climate change vulnerability, as well as planning to adapt to predicted climate change impacts. The module highlights tools developed by NOAA’s Coastal Services Center, assists decision makers in selecting the tool most appropriate for their community, and prepares them to acquire and use the tools they select. Stakeholders and decision makers who desire clear information about Great Lakes climate, as well as what we need to adapt to, why, and how.